This morning I am feeling like a fat little piggy having spent the whole weekend celebrating all that is good about French food and social eating. 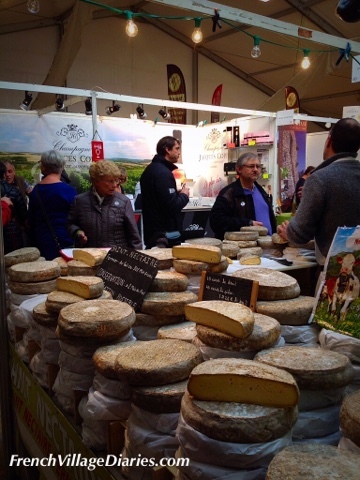 On Friday morning I set out for the regular airport run to collect Ade, but we found ourselves diverted from our usual drive home, firstly by the coffee stop that has become our routine and then by Les Gastronomades, an annual food festival in Angouleme that we have visited before (see here). 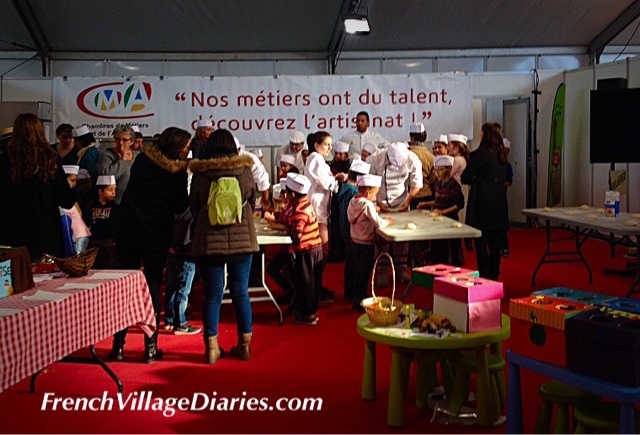 Held in a selection of marquees throughout the town, the festival promotes the local Poitou-Charentes produce, holds a huge market where producers from all over France come to sell their products, puts on displays and demonstrations by top chefs and more importantly encourages everyone, young and not so young to learn more about food and where it comes from. From snails to saucisson, wine to walnuts, fromage to foie gras and breads to Bio (organic) products, we tasted the best of flavours from Brittany in the north to the Pays Basque in the south. There were increased security measures following the recent events in Paris, but I’m delighted it was still able to go ahead and not only that but Friday is the day the event normally welcomes around 2000 school children and this year was no exception. It was lovely to see them tasting, learning and trying their hand at making too. That’s the spirit France, allons-y! 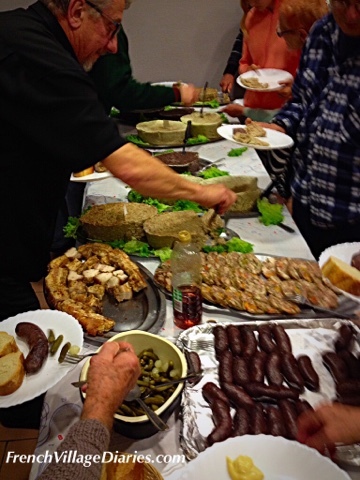 On Saturday evening we joined over a hundred others to eat a pig feast in the salle des fêtes (village hall), where a small team of experienced family cooks had spent three days preparing lots of different pork dishes. The smell of cooking pork had been lingering over the village and even tempted me to take a peek in the kitchen on Thursday afternoon. The cooked meat from the pig’s head was being mixed together with vegetables and parsley before being poured into plastic water bottles with a homemade gelatinous pork stock. 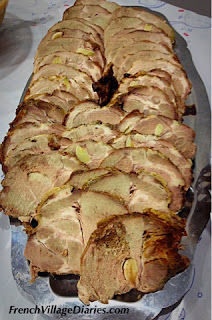 Once set, the plastic bottle was cut away leaving cylindrical blocks of fromage du tête (pig’s head cheese or brawn) that was sliced and served. There were many firsts for me, including the first time attending this annual event despite having lived here for 11 years. The pig’s head cheese was certainly a first as was the boudin noir, a black pudding type of blood sausage and the gigouri a local speciality made using cooked pig skin, belly fat, seasoning and blood. 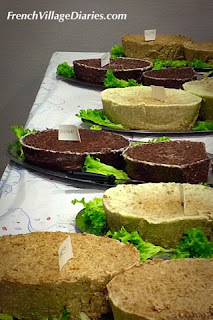 The boudin noir was delicious, the brawn ok but I think I’ll pass on the gigouri in the future. I was always a very fussy eater when I was a kid, so I think I did very well to try what I did. The main course was roast pork, studded with garlic and served with beans, then there was cheese and to top it off (at about 11.30pm) a tasty homemade apple tart. I rolled into bed after midnight feeling happy but very tired and very full. Sunday dawned and despite not really needing to eat, a Sunday isn’t a Sunday without a breakfast of coffee and croissants from the village boulangerie, so I somehow found room. Thankfully my diary is showing no major eating events until next weekend and I’m back to enjoying my simple vegetable soups, the perfect winter detox. 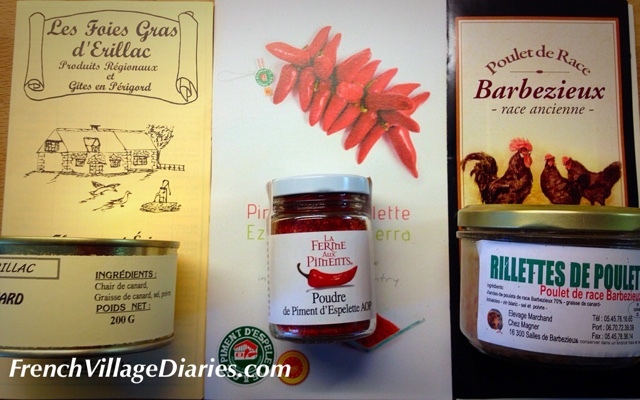 My review today is for Pardon My French: How a Grumpy American Fell in Love with France a memoir of time spent in the south of France by Allen Johnson. I was hooked from the beginning of this book when we are thrust straight into summer in France during the early seventies, with a naked lady by a pool and a rather nervous narrator. 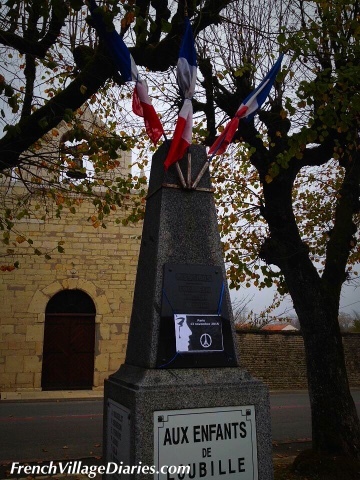 Allen certainly made me believe he had a story to tell about his time in France with his wife Nita, where living among the French was as important to them as being in France. 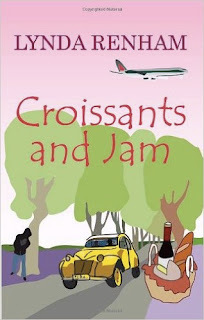 We first meet the newlyweds during their year in Grenoble, but this is just part of the story as Allen and Nita return thirty-one years later to spend another year in the country they have fallen in love with. I’ve read plenty of life in France memoirs but I’m sure I’ve not yet come across anyone else who has made such an effort to throw himself into a social life in France, especially someone who knows he is only here for a year, chapeau Allen. As well as spending time with their long standing French friends, Allen joins enough local groups to give him at least one activity every day of the week, including a hiking group, a basketball club, dance lessons and music lessons. Some were more successful than others, but each time he gave his all and tried his best to make friends with the French. The goings on at activities also gave him ample material to entertain the reader with. I enjoyed Allen’s eye for detail and witty writing style that made this an entertaining read. Sometimes I found he was getting a little bit grumpy about some of his experiences in France, but just as I was beginning to feel it was too grumpy he pulled it back and showed he wasn’t really moaning, it was just his humorous way of expelling the inevitable frustration that can arise when dealing with certain aspects of life in France. I was able to sympathize with him here, as I’m sure anyone who has ever lived in France will do too. The end of the book includes a handy section of practical advice and information for those looking to follow in Allen and Nita’s footsteps. 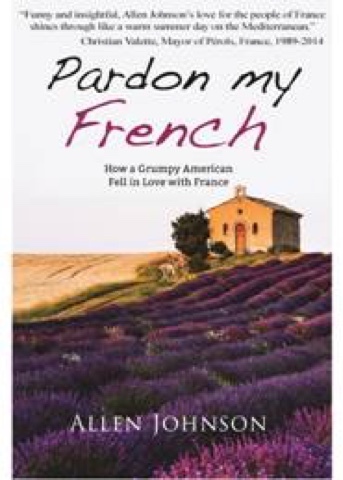 Pardon My French: How a Grumpy American Fell in Love with France is published by Yucca Publishing and is available in paperback and ebook format and links to Amazon can be found below. I know I have been a quiet blogger these last few weeks and I’m sorry. 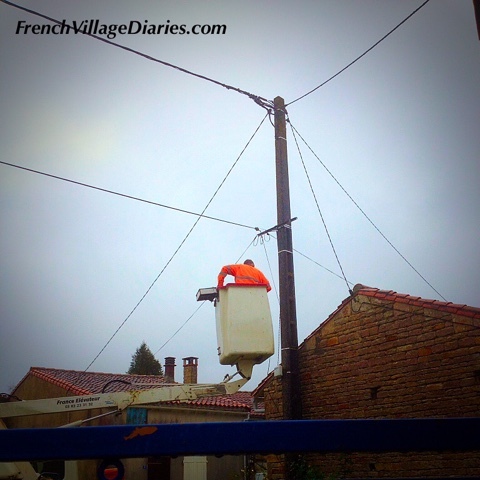 The events in Paris came at the end of a challenging week for me and the grey skies and damp days of last week didn’t do much to lift my mood, despite my own troubles having been firmly put into perspective. I don’t want to dwell on the attacks but one of the things I found most difficult was answering Ed’s questions. He is a sensible 15 year old, into music, conscientious (to a point) at school and thoroughly enjoying the increased freedom and time to hang out with his mates that being at lycée has given him, but he has a sensitive side too and is a worrier. When he asked me to explain how some people can go out and shoot random fellow human beings who were just going about their normal daily lives, I struggled to answer him. As a parent it is my job to answer his questions, to help him to understand the world he is living in and to make him feel safe and loved, but how could I give an answer when there seems to be no logical answer. The French President, François Hollande’s answer was to declare that France is at war with terrorism. The fact that my family are now living in a country that is ‘at war’ horrifies me. The President didn’t wait long to back up his words with direct action on ISIS strongholds in Syria, a country that is virtually crippled already and one whose citizens are fleeing in their thousands with many facing a retched winter with little or no food, shelter or clothing in a makeshift camp in Calais, France. This just proves to me that it is a mad and sad world we are living in and I wish I had the answer to make it a better one. My initial reaction has been to retreat into the warm and fluffy world of books, to immerse myself in the lives of others, some who were real and recounting tales of travel, others who were fictional, but no less real in my head. I’m back now and thought I would share just a few of the personal challenges I have faced in the last few weeks, in no particular order, that I can look back and laugh at now. I also have lots of reviews to share with you in the coming days, including some festive themed books and Christmas gift ideas. Being on the local council means attending meetings, but a two and half hour political meeting in French that lasted way past my bedtime was quite a challenge. It started with all 150 local councillors united in a moment of silence to remember those who lost their lives, but quickly became a heated political debate that I did my best to keep up with. I certainly slept well that night, but the following day felt rather like my brain had been run over with a steamroller. Sleep is a good healer, but when you have nocturnal visitors whose banging and crashing keep you awake half the night, the following day can be a struggle. Francine la fouine (a stone martin) left her recognisable droppings outside our dining room window before scaling the house wall and trying to break into the loft. I could hear the terracotta roof tiles being moved about and much I hate to think of a single, pregnant mother with nowhere to nest over winter, I would rather she didn’t set up home in our loft. Our builder has since been and straightened all the tiles she spent half the night trying to dislodge and it’s all gone quiet, so fingers crossed she has found more suitable accommodation. Living in a rural village and often being home alone there are few things more precious than my links to the outside world, so having had a flat battery in the car one week, followed by no internet and a dodgy phone line the following week, I wasn’t a happy bunny. I can now add using a car battery charger to my list of useful life skills and thanks to the lovely man from Orange (who made me smile by turning up wearing orange) we now have a brand new phone line coming into the house and the internet is back, yippee! Some people moan about customer service in France, but Orange were superb. They called me back when they said they would, they arrived to fix the problem when they said they would and everyone I spoke to was friendly and polite. 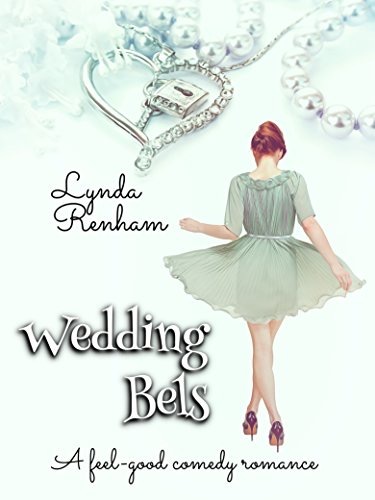 My review today is for Wedding Bels (previously released as Croissants and Jam) by Lynda Renham. Visually this book looked perfect; I loved the title, I loved the cover and I couldn’t wait to get stuck into it. What I found was a quick read that was full of silliness and that made me smile. Annabel is getting married, her fiancé Simon is successful, sensible and everything a single girl approaching her thirties could ask for. Everything has been planned and all that is left is for her to fly to Rome to meet his family and enjoy her perfect wedding day. This is when things start to go wrong and quite quickly spiral way out of control. Before she knows it she finds herself on a disastrous car journey through France, with a stranger in an ancient 2CV, while her friends and family are waiting in Rome for her wedding. The bride may be allowed to be late, but not this late. Annabel is a likeable walking disaster area, if it can go wrong it will and she will be in the middle of it. I found her endearing although I think some may find her annoying. She lacks control in her life, whether it is her mother, older sister, best mate or fiancé there is always someone there who knows what is best for her and isn’t afraid to let her know. She does so much overthinking I really felt I knew her very well by the end of the book but by then I too wanted to add my advice and was silently screaming at the pages. This book was a perfect few hours of escapism, ideal for those days when nothing seems to be going to plan as you soon realise things can’t be as bad for you as they are for Annabel. Wedding Bels is available in ebook and paperback format and links to Amazon can be found below. I’m looking forward to reading more from Lynda. This blog has been linked to the Dreaming of France weekly link up.